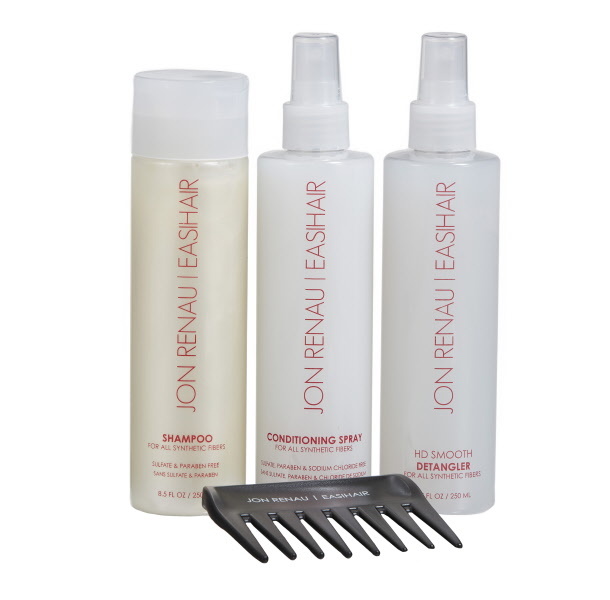 The Jon Renau Kit Includes: 8.5 oz Shampoo, Conditioning Spray, HD Smooth Detangler and Wide Tooth Comb. Jon Renau 4pc Synthetic Hair Care provides superb care for synthetic hair wigs, hair pieces and hair extensions. These luxury products, including a shampoo, conditioner and detangler are all sulfate and paraben free. Combined, with the wide tooth comb these products will leave the hair feeling soft and shiny whilst removing any tangles.